Established in 2000 under WellCore inc, SOCASA, South Orangetown Community Awareness of Substance Abuse adopted the mission to increase awareness of teenage substance abuse between teens, parents, educators and community members in order to promote education and prevention and decrease substance abuse related accidents and fatalities. 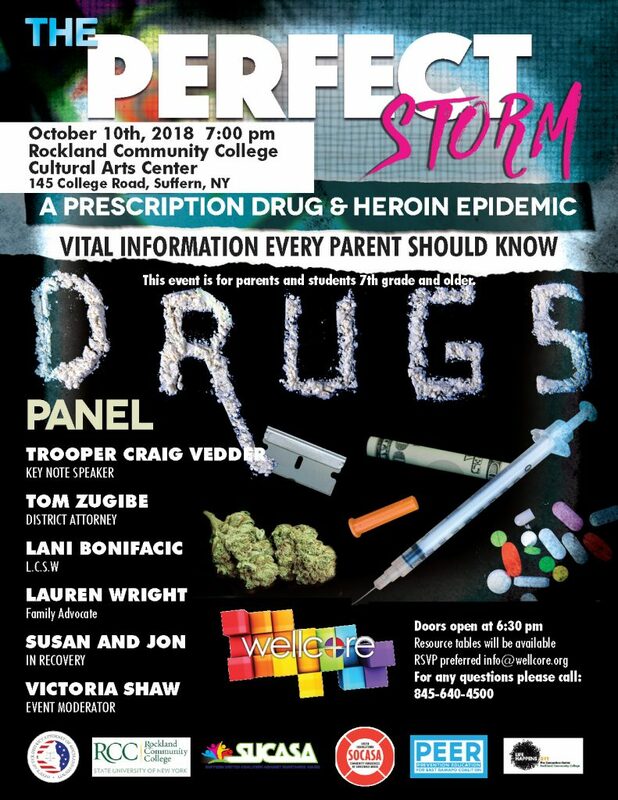 In Rockland County, accidents and fatalities resulting from the use of alcohol and drugs by teenagers have been on the rise. 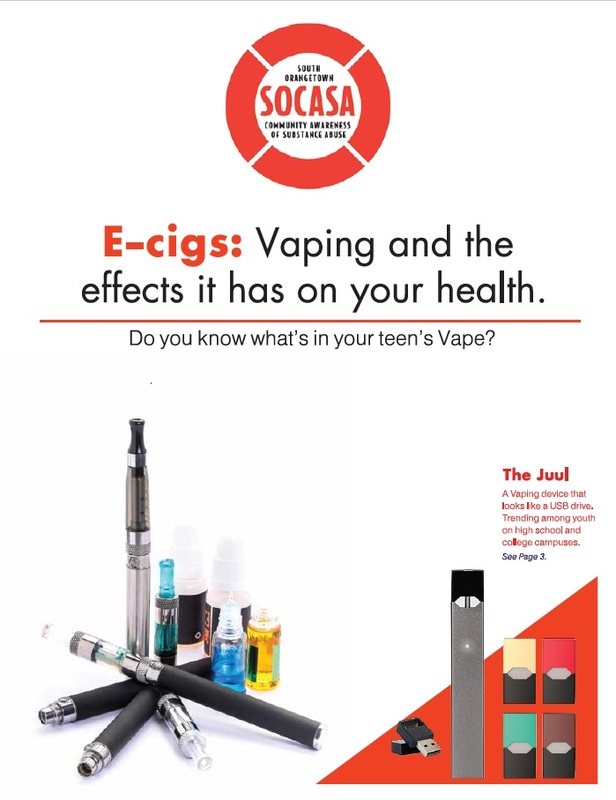 In response to this serious problem, SOCASA, together with parents, middle and high school students, and community representatives, initiated a special Drug and Alcohol Task Force. 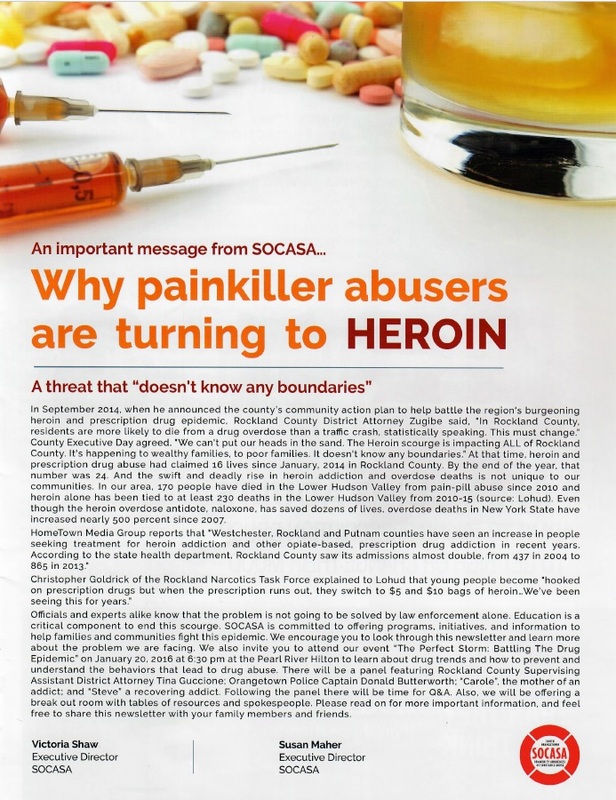 In so doing, SOCASA hopes to prevent needless tragedies that can occur when our children drink or abuse drugs. Stay informed with News, Events and Education from SOCASA Coalition. The organization raises funds to support alternate activities for students as well as education and prevention programs sponsored by the coalition. SOCASA helps develop strategies that bring parents, schools and the community together to raise awareness of substance abuse. SOCASA provides student/parent seminars and workshops on all topics related to substance use and abuse. Alternate activities in an alcohol and drug-free environment are planned for students in our community. 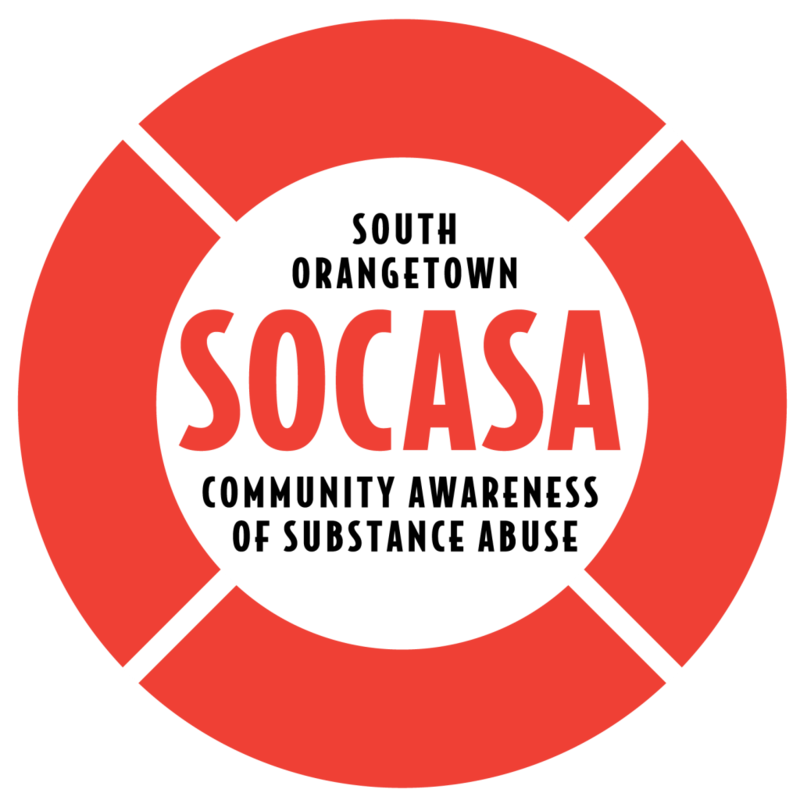 In 2015, SOCASA secured a “Now is the Time” Project AWARE Community Grant from the Substance Abuse and Mental Health Services Administration (SAMHSA), receiving the maximum grant award of $125,000 a year for three years, totaling $375,000. The program supports the training of teachers and a broad array of individuals who interact with youth through their programs at the community level in Rockland County, NY—including parents, law enforcement, faith-based leaders, and other adults—in Youth Mental Health First Aid (YMHFA), in order to increase the mental health literacy among youth-serving adults, policy-makers, and administrators of programs serving youth. The Drug-Free Communities Support Program, created by the Drug-Free Communities Act of 1997, is the Nation’s leading effort to mobilize communities to prevent youth substance use. Directed by the White House Office of National Drug Control Policy, in partnership with the Substance Abuse and Mental Health Services Administration (SAMHSA), the DFC Program provides grants to community coalitions to strengthen the infrastructure among local partners to create and sustain a reduction in local youth substance use, as well as grants to existing coalitions to mentor new programs. Through a grant from The State Farm Youth Advisory Board, students from Tappan Zee High School and Pearl River High School participate in the Orangetown Youth Court program. Youth Court, a youth-led juvenile justice alternative designed for and operated by youth, focuses on restorative justice and trains teenagers to serve as jurors, judges, and attorneys. The grant allows more Youth Court members to participate in this powerful civic opportunity and enables more juvenile offenders to make amends through constructive sanctions such as community service. Orangetown is one of 65 community organizations to receive this service-learning, youth-led grant across the United States and Canada. The State Farm Youth Advisory Board has granted over $32 million in grant money since its inception in 2006, empowering youth to implement service-learning in 520 communities. Advantage After School Programs (AASP) provides quality youth development opportunities to school-age children and youth for three hours directly after school. Research shows that children who participate in quality afterschool programs have higher school attendance and academic achievement, are less likely to be involved in risky behaviors during the afterschool hours. AASPs are supported by school, community, public and private partnerships. AASPs offer a broad range of educational, recreational and culturally age-appropriate activities that integrate what happens in the school day. AASPs also provide working parents with a safe place for their children. 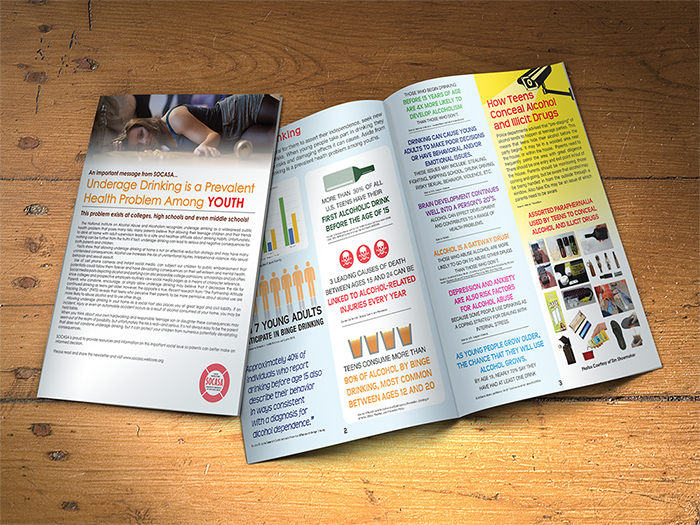 The purpose of the Sober Truth on Preventing Underage Drinking Act (STOP Act) grant program from Substance Abuse and Mental Health Services Administration (SAMHSA) is to prevent and reduce alcohol use among youth ages 12-20 in communities throughout the United States. STOP Act grant funds focus on strengthening collaboration among community entities to reduce alcohol use among youth. The Aetna Foundation provides grants to community-based initiatives that encourage healthy eating and active living. Our program creates an environment of healthy eating that includes introducing children to local farms, educating them about the origin of their food, and incorporating locally grown fruits and vegetables into their school lunch choices. Does Participation in Contact Sports Increase Risk of Opioid Use? 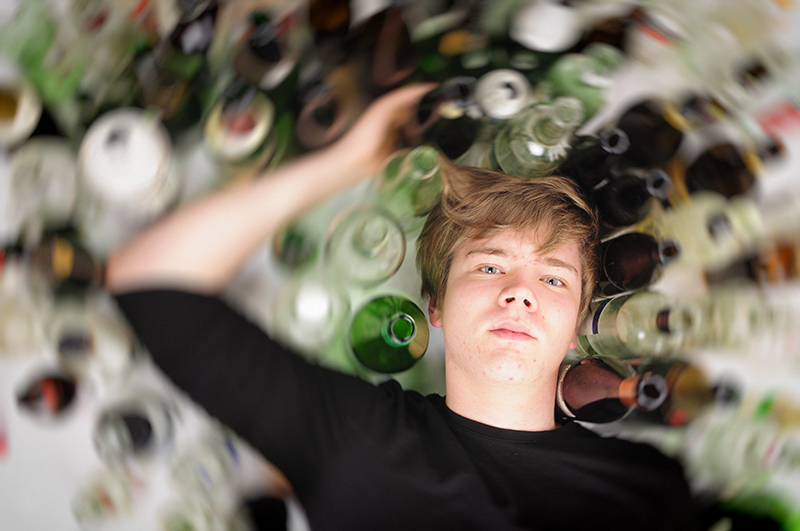 Alcohol Misuse a “Pervasive and Increasing Problem” in U.S.